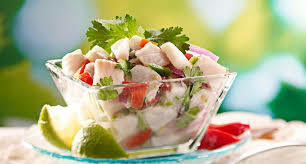 Ensalada de Carrucho (Conch Salad) - Tienditadepuertorico.com - Buy Puertorican Food Here!! In large glass bowl thoroughly toss all ingredients. Cover and refrigerate. For best flavor refrigerate overnight. and cook until tender when pierced with a fork, about 20 minutes. Drain and pat dry. of the body that doesn't need to be removed.